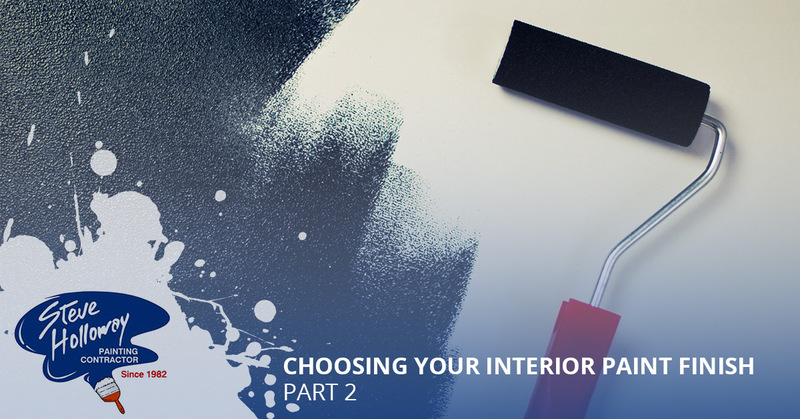 In part one of our multi-part series, we outlined some of the available types of paint finishes that can be applied to your home’s interior. While all of these paint sheens can be used inside your home, it is important to be mindful of where the paints are applied in your home. For example you wouldn’t want to use a hi-gloss paint to color your family room, as its high reflectivity can be unpleasant in such a large area. For this reason, Steve Holloway Painting has outlined each type of paint and its intended uses, so that you can have the most aesthetic outcome possible during your next interior project. Steve Holloway Painting is Bakersfield’s highest rated painting contractors that also serves the surrounding areas of California. For more than 35 years, our painting services have turned dream homes into realities for families in Bakersfield, and we continue to do so today. Learn about some of the optimal finishes for specific rooms in your home by reading part two of our multi-part series below. If you are undecided on which finish is best suited for low-trafficked areas such as your bedroom or family room, consider choosing a paint with a flat finish. Flat paints offer a cozy and inviting finish with little to no reflectivity, and are also great at disguising minor discrepancies on your walls such as scuffs or small gashes. Given that it is not as durable as hi-gloss paints, flat paints should only be used in areas of your home that are used the least. Another sheen known for its low reflectivity and luster, matte paints are a great choice for low trafficked areas of your house like your living room, bathroom, or family room. Matte paint offer an increased level of durability when compared to flat paint, making it a versatile paint that can be used nearly anywhere in your home. However, consider avoiding matter paint in your kitchen, as kitchens introduce moisture to walls, as well as splatters of food that may need to be wiped away easily. Providing users the same durability as hi-gloss paint, semi-gloss paint works best in highly trafficked areas of your home such as your hallways, kitchen, and even your cabinets. Since semi-gloss is highly resistant to moisture, it will fare exceptionally well in the areas of your home that are high in humidity such as your bathroom or near your kitchen’s stove top. The six types of paint listed in our two-part series should be carefully chosen for different applications throughout your home. Choosing to paint your whole interior using a hi-gloss paint will leave you unsatisfied with the outcome, which is why you should study the different types of paint that would look best in each room of your house. If you are ready to have your house’s interior painted by Bakersfield’s highest rated painting contractors, contact Steve Holloway Painting today. We provide all customers with a free estimate, and will work with you to decide which types of paint will look best throughout your home. We look forward to speaking with you!